Anti-clericalism refers to historical movements that oppose the clergy for reasons including their actual or alleged power and influence in all aspects of public and political life and their involvement in the everyday life of the citizen, their privileges, or their enforcement of orthodoxy. Not all anti-clericals are irreligious or anti-religious, some have been religious and have opposed clergy on the basis of institutional issues and/or disagreements in religious interpretation, such as during the Protestant Reformation. The French Revolution, particularly in its Jacobin period, initiated one of the most violent episodes of anti-clericalism in modern Europe as a reaction against the dominant role of the Catholic church in pre-revolutionary France; the new revolutionary authorities suppressed the church; destroyed, desecrated and expropriated monasteries; exiled 30,000 priests and killed hundreds more. As part of a campaign to de-Christianize France in October 1793 the Christian calendar was replaced with one reckoning from the date of the Revolution, and an atheist Cult of Reason was inaugurated, all churches not devoted to that cult being closed. In 1794, the atheistic cult was replaced with a deistic Cult of the Supreme Being. When anticlericalism became a clear goal of French revolutionaries, counter-revolutionaries seeking to restore tradition and the Ancien Régime took up arms, particularly in the War in the Vendée (1793 to 1796). A further phase of anti-clericalism occurred in the context of the French Third Republic and its dissensions with the Catholic Church. 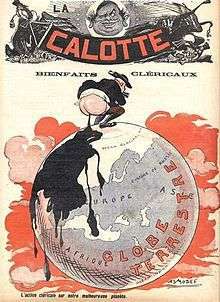 Prior to the 1905 French law on the Separation of the Churches and the State, the Catholic Church enjoyed preferential treatment from the French state (formally along with the Jewish, Lutheran and Calvinist minority religions, but in practice with much more influence than those). During the 19th century, public schools employed primarily priests as teachers, and religion was taught in schools (teachers were also obliged to lead the class to Mass). In 1881–1882 Jules Ferry's government passed the Jules Ferry laws, establishing free education (1881) and mandatory and lay education (1882), giving the basis of French public education. The Third Republic (1871–1940) firmly established itself after the 16 May 1877 crisis triggered by the Catholic Legitimists who dreamed of a return to the Ancien Régime. The 1905 law on separation of state and church was enacted with strength and vigor by the government of Radical-Socialist Émile Combes. Most Catholic schools and educational foundations were closed — except in Alsace-Lorraine which at that time was part of Germany. In the Affaire Des Fiches in France in 1904–1905, it was discovered that the anticlerical War Minister of the Combes government, General Louis André, was determining promotions based on the French Masonic Grand Orient's huge card index on public officials, detailing which were Catholic and who attended Mass, with a view to preventing their promotions. Emperor Joseph II (emperor 1765-1790) opposed what he called “contemplative” religious institutions — reclusive Catholic institutions that he perceived as doing nothing positive for the community. His policy towards them are included in what is called Josephinism. The education of priests was taken from the Church as well. Joseph established six state-run “General Seminaries.” In 1783, a Marriage Patent treated marriage as a civil contract rather than a religious institution. The Kulturkampf, literally "culture struggle") refers to German policies in reducing the role and power of the Catholic Church in Prussia, enacted from 1871 to 1878 by the Prime Minister of Prussia, Otto von Bismarck. Palikot's Movement, is an anti-clerical party founded in 2011 by politician Janusz Palikot. Palikot's Movement won 10% of the national vote at the Polish parliamentary election, 2011. This was an unprecedented result for an anti-church party in Poland, where Catholicism is believed to be deeply rooted. A first wave of anti-clericalism occurred in 1834 when under the government of Dom Pedro all convents and monasteries in Portugal were abolished, simultaneously closing some of Portugal's primary educational establishments. The Civil War in Spain started in 1936, during which thousands of churches were destroyed, thirteen bishops and some 7,000 clergy and religious Spaniards were assassinated. Catholics largely supported Franco and the Nationalist forces in the Spanish Civil War of 1936–1939. Anti-clerical assaults during what has been termed by the Nationalists Red Terror included sacking and burning monasteries and churches and killing 6,832 priests, including 13 bishops, 4,184 diocesan priests, 2,365 members of male religious orders, among them 259 Claretians, 226 Franciscans, 204 Piarists, 176 Brothers of Mary, 165 Christian Brothers, 155 Augustinians, 132 Dominicans, and 114 Jesuits. In Tortosa, 44 percent of the secular priests were killed. In Toledo 286 of 600 priests were killed. In the dioceses of Málaga, Minorca and Segorbe, about half of the priests were killed"
In Madrid 4,000 priests were murdered. One source records that 283 nuns were killed, some of whom were badly tortured. There are accounts of Catholic faithful being forced to swallow rosary beads, thrown down mine shafts and priests being forced to dig their own graves before being buried alive. The Catholic Church has canonized several martyrs of the Spanish Civil War and beatified hundreds more. The vastly different religious backgrounds of the Reformers and rouges was one of the factors which prevented them from working together well during the era of two-party coalition government in Canada (1840–1867). By 1861, however, the two group fused to create the a united Liberal block. After 1867, this party added like-minded reformers from the Maritime provinces, but struggled to win power, especially in still strongly-Catholic Quebec. In Quebec itself, the Quiet Revolution of the 1960s broke the hold of the church on provincial politics. The Quebec Liberal Party embraced formerly taboo social democratic ideas, and the state intervened in fields once dominated by the church, especially health and education, which were taken over by the provincial government. Quebec is now considered Canada's most secular province. Beginning in the 1820s, a succession of liberal regimes came to power in Latin America. Some members of these liberal regimes sought to imitate the Spain of the 1830s (and revolutionary France of a half-century earlier) in expropriating the wealth of the Catholic Church, and in imitating the eighteenth-century benevolent despots in restricting or prohibiting the religious orders. As a result, a number of these liberal regimes expropriated Church property and tried to bring education, marriage and burial under secular authority. 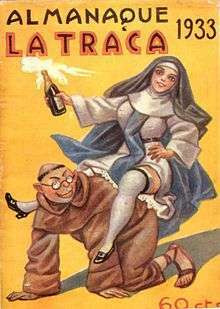 The confiscation of Church properties and changes in the scope of religious liberties (in general, increasing the rights of non-Catholics and non-observant Catholics, while licensing or prohibiting the orders) generally accompanied secularist, and later, Marxist-leaning, governmental reforms. Following the Mexican Revolution of 1910, the new Mexican Constitution of 1917 contained further anti-clerical provisions. Article 3 called for secular education in the schools and prohibited the Church from engaging in primary education; Article 5 outlawed monastic orders; Article 24 forbade public worship outside the confines of churches; and Article 27 placed restrictions on the right of religious organizations to hold property. Most offensively to Catholics, Article 130 deprived clergy members of basic political rights. Many of these laws were resisted, leading to the Cristero Rebellion of 1927–1929. The suppression of the Church included the closing of many churches and the killing of priests. The persecution was most severe in Tabasco under the atheist" governor Tomás Garrido Canabal. Most Marxist–Leninist governments have been officially anti-clerical, abolishing religious holidays, teaching atheism in schools, closing monasteries, church social and educational institutions and many churches. In the Soviet Union, anti-clericalism was expressed through the state; in the first five years alone after the Bolshevik revolution, 28 bishops and 1,200 priests were executed. In 1925, Rezā Khan founded the Imperial State of Iran and proclaimed himself shah of the country. As part of his Westernization program, the traditional role of the ruling clergy was minimized; Islamic schools were secularized, women were forbidden to wear the hijab, sharia law was abolished, and men and women were desegregated in educational and religious environments. All this infuriated the ultraconservative clergy as a class. Rezā Khan's son and heir Mohammad Reza Pahlavi continued such practices. They ultimately contributed to the Islamic Revolution of 1978–79, and the Shah's flight from his country. When Ayatollah Khomeini took power a month after the revolution, the Shah's anticlerical measures were largely overturned, replaced by an Islamic Republic based on the principle of rule by Islamic jurists, velayat-e faqih, where clerics serve as head of state and in many powerful governmental roles. However, by the late 1990s and 2000s anti-clericalism was reported to be significant in the Islamic Republic of Iran. "Iran, although an Islamic state, imbued with religion and religious symbolism, is an increasingly anti-clerical country. In a sense it resembles some Roman Catholic countries where religion is taken for granted, without public display, and with ambiguous feelings towards the clergy. Iranians tend to mock their mullahs, making mild jokes about them ..."
According to the 1913 Catholic Encyclopedia, Freemasonry was historically viewed by the Catholic Church as a principal source of anti-Clericalism, – especially in, but not limited to, historically Catholic countries. Kulturkampf, anti-Catholicism in Prussia in the 1870s. ↑ Collins, Michael (1999). The Story of Christianity. Mathew A Price. Dorling Kindersley. ISBN 978-0-7513-0467-1. 1 2 Helmstadter, Richard J. (1997). Freedom and religion in the nineteenth century. Stanford Univ. Press. p. 251. 1 2 3 Duffy, Eamon (1997). Saints and Sinners, a History of the Popes. Yale University Press in association with S4C. Library of Congress Catalog card number 97-60897. ↑ Alston, Cyprian (1907). "Benedictine Order". In Herbermann, Charles. Catholic Encyclopedia. 2. New York: Robert Appleton Company. ↑ Wootton and Fishbourne Archived September 14, 2008, at the Wayback Machine. ↑ Franklin 2006, p. 9 (footnote 26) cites Larkin, Maurice. Church and State after the Dreyfus Affair. pp. 138–41. : "Freemasonry in France". Austral Light. 6: 164–72, 241–50. 1905. ↑ Franz, H. (1910). "Joseph II". In Herbermann, Charles. Catholic Encyclopedia. 8. New York: Robert Appleton Company. ↑ Okey 2002, p. 44. ↑ Berenger 1990, p. 102. ↑ "In Germany and Austria, Freemasonry during the eighteenth century was a powerful ally of the so-called party, of "Enlightenment" (Aufklaerung), and of Josephinism" (Gruber 1909) . ↑ Maier, Hans (2004). Totalitarianism and Political Religions. trans. Jodi Bruhn. Routledge. p. 106. ISBN 0-7146-8529-1. 1 2 3 4 Jedin, Dolan & Adriányi 1981, p. 612. ↑ Franzen & Bäumer 1988, p. 397. 1 2 3 4 5 6 7 Jedin, Repgen & Dolan 1999, p. 617. 1 2 Beevor 2006, p. .
↑ Thomas 1961, p. 174. ↑ Wilton, Carol (2000). Popular Politics and Political Culture in Upper Canada 1800-1850. Montreal/Kingston: McGill-Queens University Press. pp. 51–53. ↑ "Federal Parties: The Liberal Party of Canada". Canadian-Politics.com. Archived from the original on 2011-10-10. Retrieved 2011-11-09. ↑ Sigmund, Paul E. (1996). "Religious Human Rights in the World Today: A Report on the 1994 Atlanta Conference: Legal Perspectives on Religious Human Rights: Religious Human Rights in Latin America". Emory International Law Review. Emory University School of Law. ↑ Van Hove, Brian (1994). "Blood Drenched Altars". EWTN. Retrieved 2008-03-09. ↑ John W. Sherman (1997). The Mexican right: the end of revolutionary reform, 1929–1940. Greenwood Publishing Group. pp. 43–45. ISBN 978-0-275-95736-0. ↑ Marjorie Becker (1995). Setting the Virgin on fire: Lázaro Cárdenas, Michoacán peasants, and the redemption of the Mexican Revolution. University of California Press. pp. 124–126. ISBN 978-0-520-08419-3. ↑ Cora Govers (2006). Performing the community: representation, ritual and reciprocity in the Totonac Highlands of Mexico. LIT Verlag Münster. p. 132. ISBN 978-3-8258-9751-2. ↑ Nathaniel Weyl, Mrs. Sylvia Castleton Weyl (1939). The reconquest of Mexico: the years of Lázaro Cárdenas. Oxford university press. p. 322. ↑ Bergquist, Charles; David J. Robinson (1997–2005). "Colombia". Microsoft Encarta Online Encyclopedia 2005. Microsoft Corporation. Archived from the original on 2009-10-31. Retrieved April 16, 2006. On April 9, 1948, Gaitán was assassinated outside his law offices in downtown Bogotá. The assassination marked the start of a decade of bloodshed, called La Violencia (the violence), which took the lives of an estimated 180,000 Colombians before it subsided in 1958. ↑ Williford 2005, p. 218. ↑ Ostling, Richard (June 24, 2001). "Cross meets Kremlin". TIME Magazine. Archived from the original on 13 August 2007. Retrieved 2007-07-03. Beevor, Antony (2006), The Battle For Spain; The Spanish Civil War 1936-1939, London: Weidenfeld and Nicholson . Gruber, Hermann (1909). "Masonry (Freemasonry)". In Herbermann, Charles. Catholic Encyclopedia. 6. New York: Robert Appleton Company.